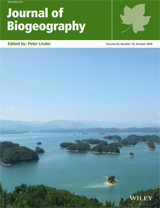 Aim: Investigate relationships between fragmentation and species diversity in the context of the theory of island biogeography, sample-area effect, and habitat diversity hypothesis. Location: Lake of the Woods, Canada. Taxon: Vascular plants Methods: Vascular plant species diversity was inventoried on 30 islands, organized into two island sets. Each island set contained four size classes that varied in degree of fragmentation while controlling for the sample-area effect (small island set: 8×0.1-ha, 4×0.2-ha, 2×0.4-ha, and 1×0.8-ha islands; large island set: identical pattern utilizing 1.0-ha to 8.0-ha islands). Fragmentation effects were then examined using SLOSS-based analyses, addressing whether single large or several small islands contained more species: (1) direct comparisons of species and habitat richness across size classes; (2) extrapolations of species-area relationships; and (3) analyses of species and habitat accumulation curves. Multigroup path analysis was next used to quantify effects of habitat diversity, island area, and isolation on species richness for both island sets. Finally, pairwise and multiple-site dissimilarity was estimated for both species and habitats across 0.1-ha and 1.0-ha islands to investigate whether: (1) variation in species composition was related to habitat composition; and (2) species dissimilarity increased with inter-island distance. Results: SLOSS-based analyses indicated that several small islands contained more species than single large islands in both island sets. This pattern was also observed for habitats, but only in the small islands set. Path analysis suggested that island area had significant direct and indirect effects (mediated by habitat diversity) on species richness. Habitat diversity and island isolation had significant positive and negative effects on species richness, respectively, independent of island area. Species and habitat dissimilarities were significantly related across 0.1-ha but not 1.0-ha islands, and showed no relationship to inter-island distance. Main Conclusions: The overall positive relationship between fragmentation and species richness may be attributed to greater habitat diversity and increased species dissimilarity across smaller islands relative to larger islands. However, negative isolation effects indicate that landscape configuration is still an important conservation consideration. These results each align with different predictions of the theory of island biogeography, sample-area effect, and habitat diversity hypothesis, questioning the exclusivity of these theoretical frameworks.